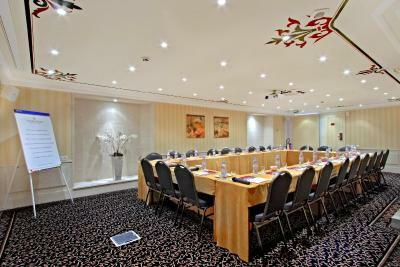 Lock in a great price for Golden Tulip Cannes Hotel de Paris – rated 8.1 by recent guests! 12 ladies went for a special birthday and the staff were great, really friendly and helpful. Hotel was next to a main Road but once the windows in our room were closed you wouldn't know it. Great location too. The hotel staff were lovely, very helpful. The rooms were bright and clean, extremely comfortable. The pool area relaxing. The hotel arranged for us to use a private beach club, which was utter luxury. We had a fantastic trip. Cannes is amazing. Every one, so friendly. I liked this hotel. Good location for the beach, restaurants and shops. 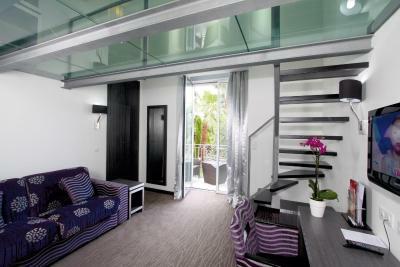 Comfortable room with lovely balcony. Friendly staff. Staff were fantastic, professional, polite and very efficient. The hotel itself is very well maintained, clean and has great character. Convenient location to the bus and rail links. 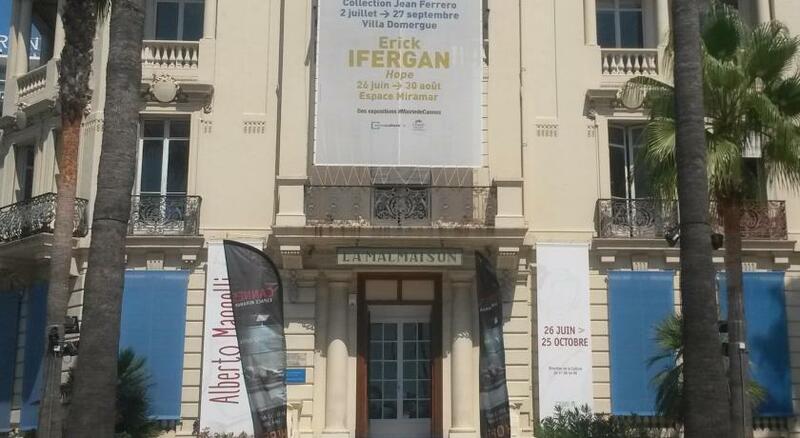 Good location for walking around Cannes and seeing the sites. 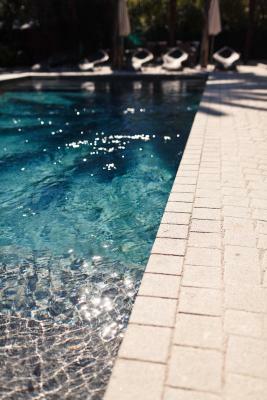 Pretty pool area. Quaint style to the rooms on fourth floor. Phillipe was really helpful with making recommendations on local sites to visit and also restaurant recommendations. A complimentary drink when one element of our stay went bad (missing luggage which was resolved/found). 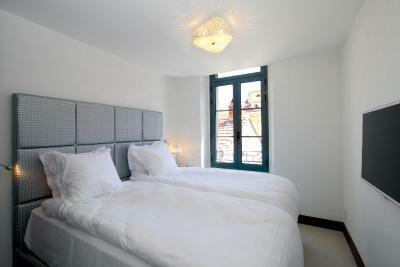 Very clean and recently renovated rooms. We were upgraded to a bigger room with balcony and view on the pool. Also it was not a problem to get a later check out. Very friendly staf. Very nice and tidy. Kind personnel at the reception desk and all the other we interact in the hotel. One of our top picks in Cannes.Located in the heart of Cannes, Golden Tulip Cannes Hotel de Paris is 1,650 feet from La Croisette, and guests of the property benefit from reduced rates to select private beaches. 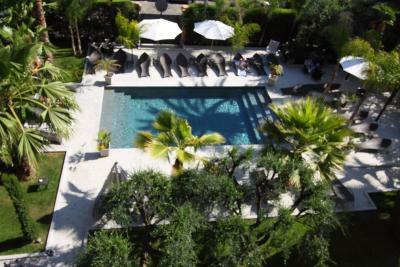 The swimming pool is set in a garden planted with olive and cypress trees. 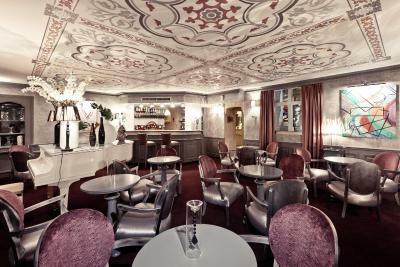 A former 19th-century mansion, Golden Tulip Cannes offers rooms and suites decorated in baroque and contemporary design. They are equipped with air conditioning, WiFi access and some have a terrace or balcony with views of the garden or pool. 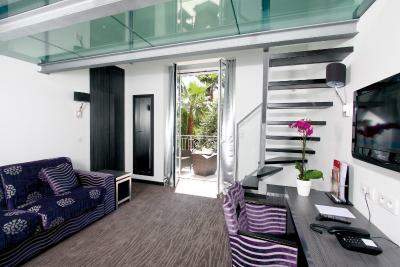 Guests can also stay in one of the hotel's apartments, located on the street behind the Golden Tulip Cannes Hotel de Paris. Each apartment has a fully equipped kitchen with an oven, dishwasher and coffee machine, in addition to a living and dining area. 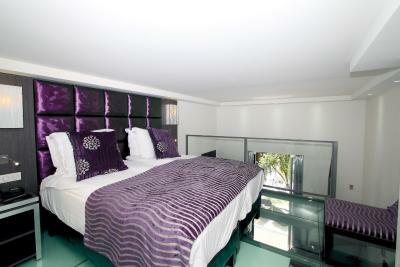 Guests staying in the apartments benefit from access to all the hotel facilities. 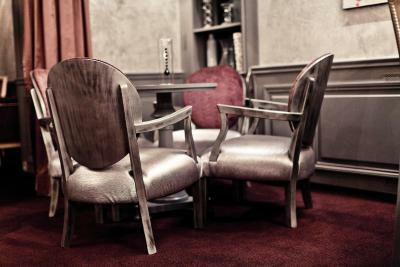 The breakfast room was renovated in winter 2017 and is decorated in an elegant baroque style, with purple and silver velvet fabrics. 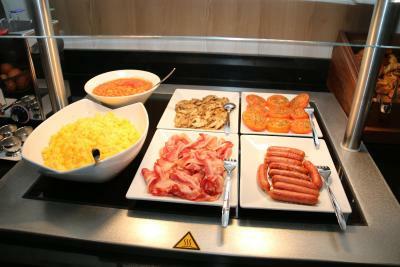 A full breakfast buffet is served daily. 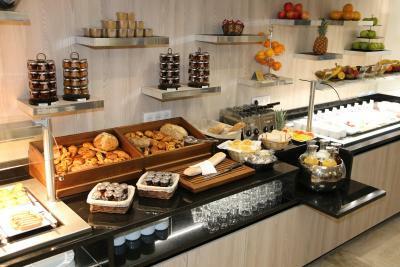 In the summer there is a snack bar by the pool, and guests can relax on the terrace. Meeting rooms are available onsite and are equipped with video projectors and a dedicated WiFi connection. Microphones can also be provided upon request. 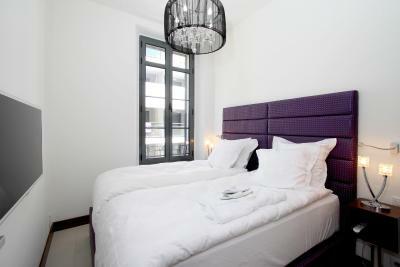 The rooms are lit by natural daylight and can be modified to suit your requirements. 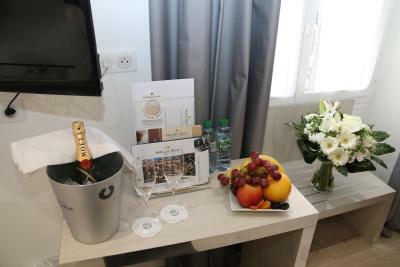 The Golden Tulip Cannes Hotel de Paris is just a 3-minute walk from the famous shopping street, Rue d’Antibes and a 11-minute walk from the Palais des Festivals. Cannes Train Station is just 1,650 feet away, while Nice Côte d'Azur Airport is 15 mi away. 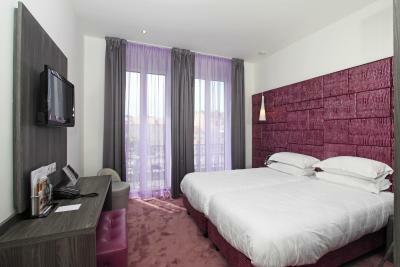 When would you like to stay at Golden Tulip Cannes Hotel de Paris? Some of these rooms are on the front side of the building and offer views of the swimming pool and the garden, and some are attic rooms with access to a small terrace. All provide free Wi-Fi access. 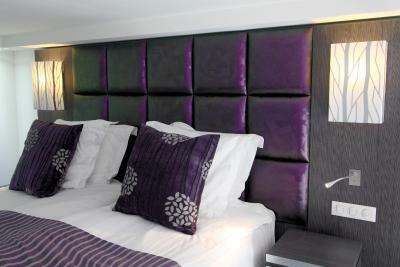 The triple rooms can be double rooms with an extra bed. This spacious suite features a separate living room or a mezzanine. 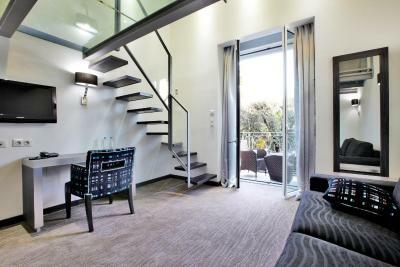 Located 262 feet behind the Golden Tulip Cannes Hotel de Paris in Villa Annette Cannes, this air-conditioned apartment has a living area with a TV and a bedroom with a safe, a TV and a private bathroom with a walk-in shower. There is a fully equipped kitchen with a microwave, a stovetop, a dishwasher and a refrigerator. Guests also have access to a washing machine and a tumble dryer on the basement level, as well as a shared swimming pool. Please note that a EUR 500 damage deposit will be requested upon arrival. This may be used to charge for any damages incurred to the accommodations during your stay. 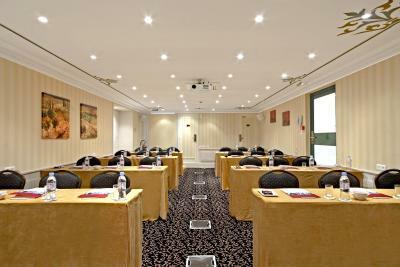 Please note that guests check in at the reception of the Golden Tulip Cannes Hotel de Paris. Check-out is before 11:00. 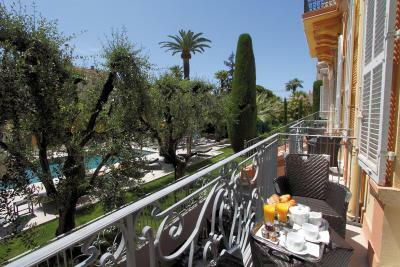 Located 262 feet behind the Golden Tulip Cannes Hotel de Paris in Villa Annette Cannes, this air-conditioned apartment has a fully equipped kitchen and a living and dining area. There is a bathroom with a shower and hairdryer. Guests in this apartment benefit from access to a shared indoor swimming pool in the basement of the building. Please note that a deposit of EUR 750 will be charged upon check-in. This may be used to guarantee any damages incurred to the apartment during your stay. This suite has a private entrance, cable TV and soundproofing. Luxury 4 star with 700 square meters of garden wing, outdoor pool, just a 8 minute walk away from la Croisette beach. House Rules Golden Tulip Cannes Hotel de Paris takes special requests – add in the next step! 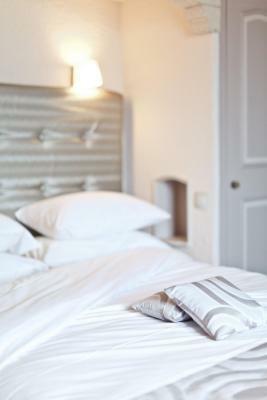 One child under 16 years is charged EUR 60 per night when using existing beds. Golden Tulip Cannes Hotel de Paris accepts these cards and reserves the right to temporarily hold an amount prior to arrival. Please note that for the One-Bedroom Apartment and for the Two-Bedroom Apartment, check-out is until 11:00. Check-in takes place at the hotel reception. Loungers and parasols are available depending on availability. 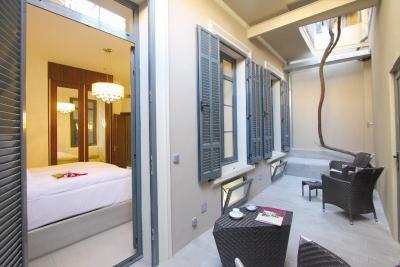 Please note that the property accepts prepayments up to EUR 400 by credit card. For any higher amount the prepayment is due by bank transfer. The property will contact you directly to organize this. Please note that pool towels are not included in the price. 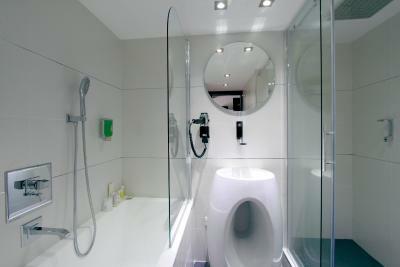 Guests can either purchase a towel for EUR 13 or rent a towel for EUR 6. Rented towels are not replaced during your stay. 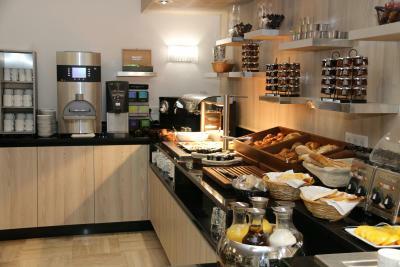 If guests cannot show a credit card upon arrival, a EUR 200 security deposit in cash is requested. Please note that the full amount of the reservation is due before arrival. Golden Tulip will send a confirmation with detailed payment information. After full payment is taken, the property's details, including the address and where to pick up the keys, will be sent to you by email. 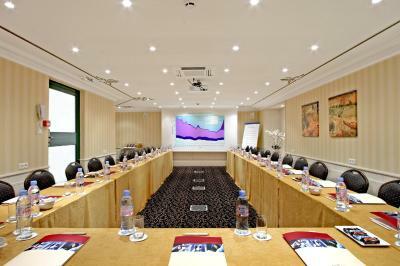 Please inform Golden Tulip Cannes Hotel de Paris of your expected arrival time in advance. You can use the Special Requests box when booking, or contact the property directly using the contact details in your confirmation. Wifi was not good, very unstable or poor connection. Furniture (apart from beds) were old and tatty - especially the sofa bed. The junior suite was nice. Breakfast was perfect. Room immaculate. Only Cons are you have to pay €25 euro night for parking. And they don't give towels for the pool you have to buy them from reception for €13, which is ridiculous after paying for room. Also There is a small tax around €1.42 per person per night also. But other than those things hotel is very good. Be aware that hotel is situated next to a busy road junction (ambulances, police cars with sirens!) and that the main railway line goes past the hotel, so a lot of traffic and train noise until late at night, and again early in the morning. Hotel is some way away from the main tourist area and the beaches, so a fairly long walk, and there is no restaurant in the evenings in the hotel, so you have to go out into the town. Only downfall was the "hairdryer" which was a standard hotel hairdryer attached to the wall and didn't work very well. Our room was overlooking the pool, the Motorway beside was quite noisy , also the walls are very thin so you can hear your neighbours on both sides, that's the only downfall, I'd recommend earplugs. 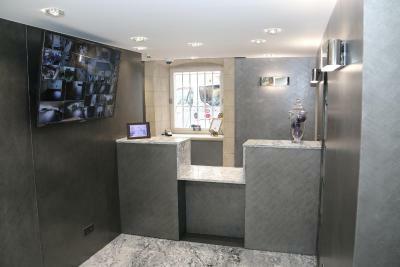 Great location, 5 mins walk from the Croisette. Plenty of nice restaurants and supermarkets nearby. The hotel is very nice, we opted for a superior double room because it was bigger and I'm glad we did as we stayed 1 week. Rooms are basic but very clean,and comfortable, same with the bathroom. Pool area is great, nice and big, with plenty of chairs, this seems hard to come by in Cannes. All in all a great stay, I would go again, and I would recommend. No separate hair dryer in the room. The hair dryer affixed to the wall was cumbersome and useless. It had a nice pool area.